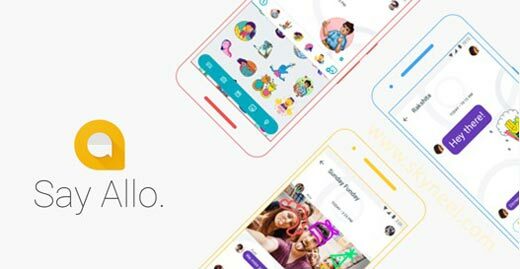 Google launches his latest instant messaging Allo app which gives a great competition to WhatsApp and Hike. As per the latest news Google launches Google Allo app compete with WhatsApp and Hike which comes with great interesting and useful features. All we know WhatsApp and Hike very popular instant messaging app which is used by billion of users around the world. But Google latest instant messaging Allo app not only comes with great features but also gives great competition to WhatsApp and Hike. At present time WhatsApp and Hike very popular instant messaging apps. Now, Google launches latest Google Allo app which not only compete with WhatsApp and Hike but also provide different great features. At present time Google Allo instant messaging app does not available for downloading purpose on Google Play Store. But you can register to download Google Allo app. After this launching Google Allo App you will get a downloading link which is send to your email id. Google Allo app comes with artificial intelligence. After the tremendous hard-work done by the Google to making instant messaging Google Allo app. Google write an important thing in his blog post that users can give smart reply to each other with Allo instant messaging app . During reply to other person the Allo app gives you suggestions. The suggestion would be exactly the same just like when you writing a short email arrives in the inbox App. It will help user to give quick reply to others. Google uses image reconize software in Allo instant messaging app. If any users send and image with the help of Google Allo app to other then you will get suggestion for quick reply. There is no need to type the sentence for reply. You can also get suggestion to download different incredible games and videos. Google Allo app allow his users to increase or decrease the size of messages with the help of send button. During typing the message we have to turn on Capslock key to start typing in capital letters. But there is no need to press Capslock key during typing the message in capital letters. During the chatting the chat users can read the chat with the help of Incognito mode in Google Allo app. We have to wait and watch when Google launches latest Google Allo app which compete with WhatsApp and Hike existing instant messaging apps. But it is definitely sure that Google give healthy and great competition to WhatsApp and Hike.